Russian President Dmitry Medvedev takes questions from journalists during a press conference on May 18, 2011 in Skolkovo, Russia. It was impossible to pinpoint the exact moment of the transformation, but by the time Russian President Dmitri Medvedev left the podium after his first big press conference on Wednesday, he had morphed into a lame duck. The problem was not so much that he failed to state his plans for re-election next year, but, as some members of his own circle now admit, the President seemed to be courting a constituency of just one man  Prime Minister Vladimir Putin, who will alone decide whether Medvedev stays or goes. That is not how the dynamic between them has recently been judged. Perhaps naively, many of Medvedev's supporters had started to believe that the President was not only an independent leader but a possible rival of Putin in the presidential race. They based this view on a series of increasingly heated spats between them, with the fiercest one coming on March 21, when Putin lashed out at the West for the bombing of Libya. That same day, Medvedev donned a leather jacket with the emblem "Commander in Chief" and went before the cameras to defend the opposite point of view. Top ministers quickly fell into line behind him, and a rift seemed to show in the political elites as officials began listing toward one or the other leader. By that time, members of Medvedev's camp had already made their vision of the 2012 vote clear. Igor Yurgens, a presidential adviser and the chairman of a think tank headed by Medvedev, said in January that Putin should not even run, as "everyone is tired of looking at the same face." But Evgeny Gontmakher, a board member at Medvedev's think tank, the Institute of Contemporary Development, now says the game is over. "There was this idea that Medvedev could land out of thin air and introduce American notions of competition into the Russian political system. This was a silly idea," he tells TIME. "Medvedev's goals and plans have faced very serious limitations that were made clear to him recently." He declines to elaborate on how exactly they had been made clear, saying only that "the limitations are linked to the fact that [Medvedev] has no political force, no party that he can rely on." Putin on the other hand has a sound base as chairman of the United Russia party, which dominates the bureaucracy and virtually every elected body in the country. "Whatever Putin says, United Russia will do," says Gontmakher. "If Putin tells them to support Medvedev [in the elections], then that is what it will do. If Putin says don't, then Medvedev will simply be ousted. That is the reality." In looking for his own political base, Medvedev could have turned to Fair Russia, a pro-Kremlin party which holds a sizable minority in both houses of Russia's parliament. Last year, a few of its leading members even created an alliance of bureaucrats and politicians to cheer on Medvedev's policies, offering themselves as a base of support. But Medvedev refused to have any ties with that group, and on Wednesday, the leader of Fair Russia, Sergei Mironov, was stripped of his seat as speaker of the upper house of parliament, robbing the party of its highest political office. 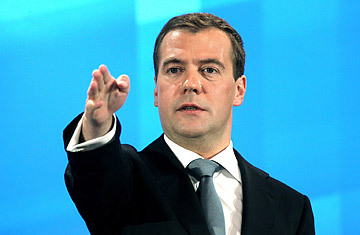 Bizarrely, Medvedev endorsed the move during Wednesday's press conference, saying it was "nothing out of the ordinary." "Sooner or later, every statesman's career comes to an end, and that also includes the president," Medvedev told the 800 journalists in attendance. It was a tone of defeatism not to be heard from Putin heading into this election cycle. On May 6, the Prime Minister re-asserted his role inside United Russia by creating what he called the All-Russian People's Front, an alliance of labor unions and civil society groups meant to shore up support for the party and, by association, for Putin himself. It was an obvious pre-election maneuver, and at Wednesday's press conference, everyone was waiting for Medvedev to make some retort, to announce his own political movement or suggest some counterweight to United Russia's dominance. There was nothing of the sort. "Even the most modest expectations were let down," says Masha Lipman, a political analyst in Moscow. Not only was Medvedev's rhetoric dry, Lipman says, but it seemed to have been purged of any challenges to Putin. Even his position on Libya was brought closer into line with the Prime Minister's, and when he was asked about his intention to run for re-election, Medvedev rattled off a series of almost meaningless platitudes  "we do our work in order to meet our goals"  before stating that the decision on his candidacy would be made "in fairly short order." But judging by Thursday's morning headlines, the Russian press was quick to make the decision for him. The financial newspaper RBK Daily ran a lead story saying that investors  the bookmakers of global politics  had placed their bets on Putin to return to the presidency in 2012, while the Vedomosti daily proclaimed in a headline, "Medvedev held his first press conference as if it were his last." Over the next few months, Russians will be looking for the official announcement of United Russia's candidate for the 2012 vote, and Gontmakher says it will likely come soon, even if it now seems like a formality. "In Russia a president cannot be allowed to be a lame duck for long. It creates too much confusion among the elites.... So this has to be resolved." It is still possible that Medvedev will stay on as president, but only if Putin endorses him the way he did in 2008, when he ceded the Kremlin to Medvedev. In any case, one thing is already clear: the decision will be up to Putin. See pictures of world leaders on vacation. See Putin's place in history.